An almost two-year process that began in April 2017 will come to fruition on the final weekend of March when USL League One kicks off its inaugural season as the only USSF sanctioned Division III professional league in the country. Over that span, League One has formed its identity through the addition of 10 high-level clubs that will compete in its inaugural 2019 campaign, culminating in the League One Playoffs this October. With just under 80 days left until the league’s first kick of the ball, all ten clubs are currently hard at work building rosters, rounding out technical staff, and developing their on-field identities. Ultimately, the right set of signings could be the key factor in earning a top-four finish and a place in the league’s inaugural postseason. Red Wolves SC has been one of the busier League One clubs so far this offseason, having announced 12 players by the first day of the 2019 calendar year. 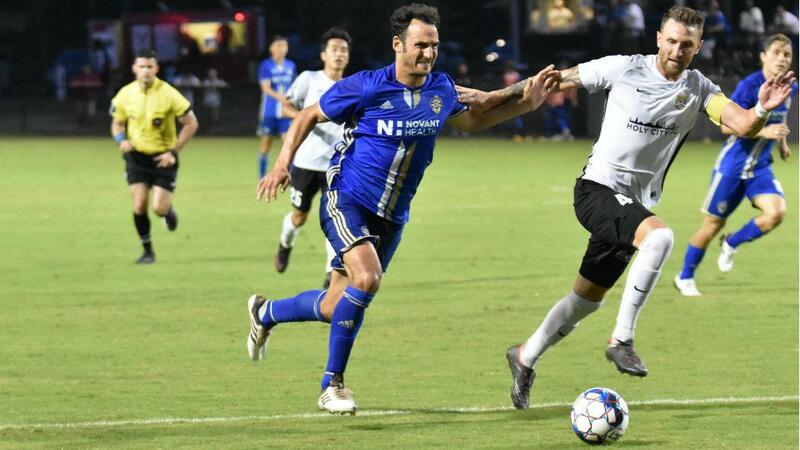 Zayed may be the best of the bunch as the 35-year-old forward brings a load of experience and a keen eye for goal to Chattanooga. Zayed led the line for the Charlotte Independence in the USL Championship last season and netted eight goals in 25 appearances. Before that, he scored 26 goals over two seasons for Indy Eleven and has shown throughout his career that he’ll produce the goods at every stop, registering over 200 goals in his senior club career. In Zayed, Red Wolves SC Head Coach Tim Hankinson has a player that he can rely on to find the back of the net as well as mentor some of the team’s younger players. Speaking of Chattanooga’s younger players, 24-year-old Ualefi looks to be another shrewd signing for Hankinson’s side after joining from Barretos Esporte Clube in his native Brazil. Ualefi has proven to be dependable in defensive midfield, appearing in every contest for Barretos during the 2017-18 season while adding nine assists. Like Zayed, Ualefi also brings USL Championship experience with him to the club after spending the two previous seasons with the Swope Park Rangers. In 2016, Ualefi was the only player to start every regular season match for the Rangers, notching four assists and placing second on the team in minutes played with a total of 2,511. That level of consistency should see him quickly become one of the first names on the Red Wolves’ team sheet. Smart was Forward Madison FC’s first signing back in October and will reunite with Madison Managing Director Peter Wilt, his General Manager with Indy Eleven, and Head Coach and Technical Director Daryl Shore, who was his assistant coach with Miami FC 2. That should help ease Smart’s adjustment to League One after the 31-year-old midfielder made 17 appearances for the Florida side in 2018, contributing four goals and seven assists to the team’s title-winning campaign. Smart spent the previous four seasons with Indy, scoring 10 goals and adding 12 assists in 95 appearances for the club. While he’s now on the plus-side of 30, Smart still has some gas in the tank and will look to link up with Madison’s veteran forward signing J.C. Banks. Banks was the first Wisconsinite to join Forward Madison FC and will look to make an immediate impact back in his home state. After playing collegiately at the University of Wisconsin-Green Bay, Banks latched on with the Rochester Rhinos before the 2011 USL Championship season and went on to make 89 appearances for the side, scoring 17 goals over four seasons. The 29-year-old forward has also had stops with Minnesota United FC and Jacksonville Armada FC in 2017. After netting just eight goals over two seasons with the Armada, Banks will look to revive his best form for the club’s inaugural season, but the native son looks set to be a big figure on and off the field in Madison’s first season. Greenville may only have made one signing thus far but bringing in Polak is a pretty good launching point for the club’s inaugural roster. The 26-year-old defender split time between Saint Louis FC and Miami FC 2 last season and made 49 appearances over the previous two years for FC Cincinnati in the USL Championship. Polak also offers limited MLS experience with the New England Revolution and will look to make an impact on both ends of the pitch from his left-back position. Gomez became Lansing’s first signing in early December and the 24-year-old will look to ignite his professional career after an inauspicious start. The midfielder was the 41st overall pick by Minnesota United FC in 2018 MLS SuperDraft but didn’t stick with the club before signing in Lansing as a free agent. That doesn’t mean Gomez doesn’t have the talent to turn things around though, as he was a three-year starter at the University of Nebraska and recorded eight goals and five assists in 2017 to help lead the team into the NCAA tournament. Ignite FC Head Coach Nate Miller raves about Gomez’s passing from the center of the park and it won’t be surprising to see him rediscover his form and be a creative force in 2019. North Texas SC has made just three signings so far this offseason – each one a product of the FC Dallas Academy system – but there’s been plenty for the club and its fans to get excited about. Pepi, the club’s first signing, has been putting up outrageous statistics in the youth ranks at just 15 years of age. He has scored 19 goals in just eight appearances for the FC Dallas U-17 Academy team this season and recently appeared as the youngest member of the U.S. U-17 National Team at the 2018 Nike Friendlies, scoring the game-winner in a 1-0 victory over Turkey. The 6-foot-1 forward will certainly be one to watch for the future but there will be plenty of interest in how he adjusts to the professional game as well. Based on his impressive scoring records at every level thus far, it won’t be a surprise to see him to continue to find the back of the net with regularity this season. Chin had a quiet campaign last season for Pittsburgh Riverhounds SC in the USL Championship, but brings with him a history of success at that level from his time with Orlando City SC. The 31-year-old Jamaican won two USL Cups and three regular season championships in four seasons with the club (2011-2014) and claimed the USL Golden Boot in 2012 with 11 goals. Chin scored 22 goals during his time in Orlando but has struggled to recreate that form in recent years at stops with Pittsburgh, Phoenix Rising FC and Ottawa Fury FC. While Chin may not find the back of the net as much as he once did, he still offers a threat up top and will bring a winning mentality to Richmond, which has struggled to get results over the past two seasons. Tormenta FC has made 16 signings so far this offseason – the most by any League One club – and seems to have found a promising forward in Hellmann, who has featured for German side FC Astoria Walldorf as well as the Charlotte Independence of the USL Championship. Before turning pro, Hellman had a distinguished collegiate career at Lynn University where he scored 49 goals and provided 29 assists in 45 career appearances. In 2014, he helped his team capture the NCAA Division II National Championship by leading the Division II in goals and earning NCAA Offensive Player of the Year honors. While in college, Hellmann played two seasons with USL League Two’s Des Moines Menace and was a named a finalist for the league’s Most Valuable Player award in 2014. At 26 years old, the Cologne, Germany native has yet to enter the prime of his career and should be in line to build on his record of success in Statesboro. Okello doesn’t qualify as a new signing for TFC II but the 18-year-old midfielder returns to the club for its first season in League One with plenty to prove. A Toronto native, Okello made 22 appearances for the Canadian club in the USL Championship last season, primarily playing in a defensive midfield role. He ranked second amongst TFC II midfielders in clearances (30) and fourth in duels won (87) while adding one assist on the offensive end of the field. However, Okello burst onto the scene at the 2018 Concacaf U-20 Championship, netting three goals for Canada in five games to help the side to a second-place finish in Group D. That string of performances sets the foundation for a vital season for Okello, who could see himself earn an MLS contract if he can prove to be a consistent box-to-box midfielder over the course of this season.